Hurricane Maria storm & surge watches raised for U.S.
Hurricane Maria which has been churning through the Atlantic following its devastating hit on Dominica, Puerto Rico and the Caribbean, now poses a growing threat to the United States, as its track shifted a little west and tropical storm and storm surge watches were raised for parts of the coast. 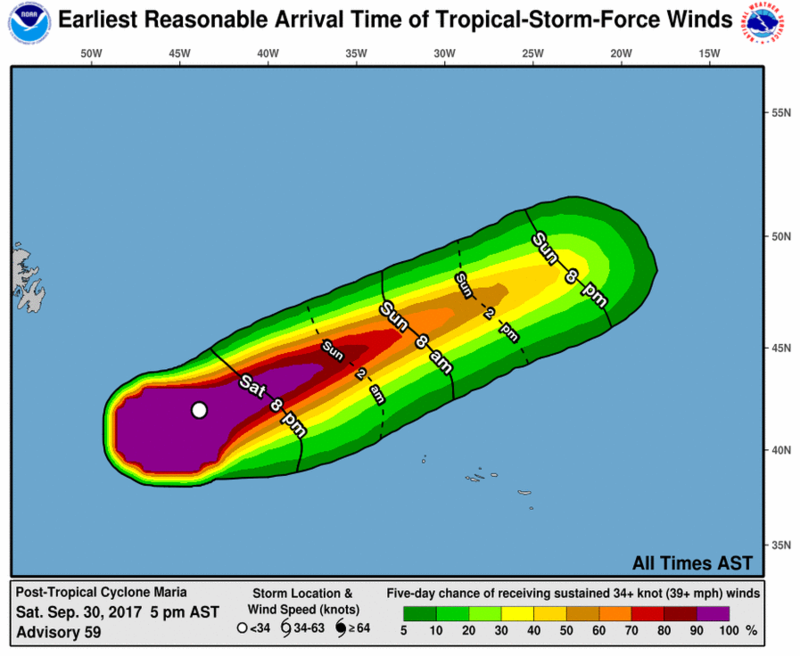 Hurricane Maria’s path has been uncertain as it headed north from the Caribbean and while the storm is expected to miss a direct hit on the U.S., some impacts on the coast are now considered likely as it will come closest around the tip of North Carolina and the Outer Banks. 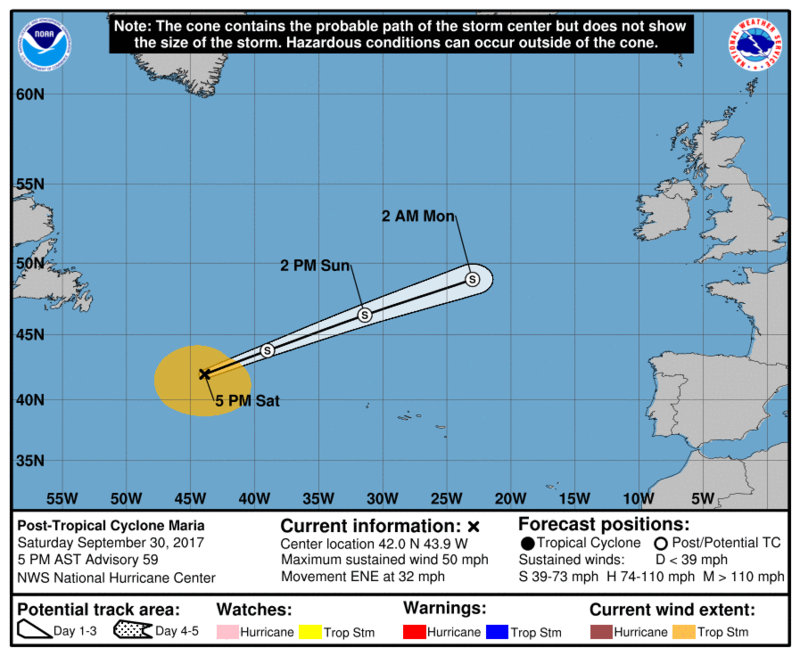 Maria remains a large hurricane, with sustained winds of 85 mph, a minimum central pressure of 954mb and storm force winds extending outwards up to 230 miles as at 06:00 UTC 25th September. Hurricane Maria’s winds have slowed considerably since its landfall in Puerto Rico, where significant devastation has been reported and the insurance and reinsurance industry will suffer further large claims in this 2017 hurricane season. It’s expected that even if hurricane Maria takes more of a track towards the U.S., it would only be a glancing blow on the North Carolina coastline, but the NHC says to expect some tropical storm conditions, including a risk of coastal inundation through flooding. Further shifts west in the forecast path of hurricane Maria could amplify the coastal impacts that will be felt, raising the chances of some impacts to insurance or reinsurance providers. At this time the financial cost of hurricane Maria remains unclear, but it is expected that the insurance and reinsurance industry will pay a number of billions of dollars for the damage to Puerto Rico alone, so raising the 2017 hurricane season toll. One Maria passes the U.S. the season may not be over, as meteorologists warn that tropical waters remain sufficiently warm to support further hurricane formations and the season still has some weeks to run. You can track the hurricane season over at our dedicated page and all the graphics in this article will update automatically, so stay tuned.